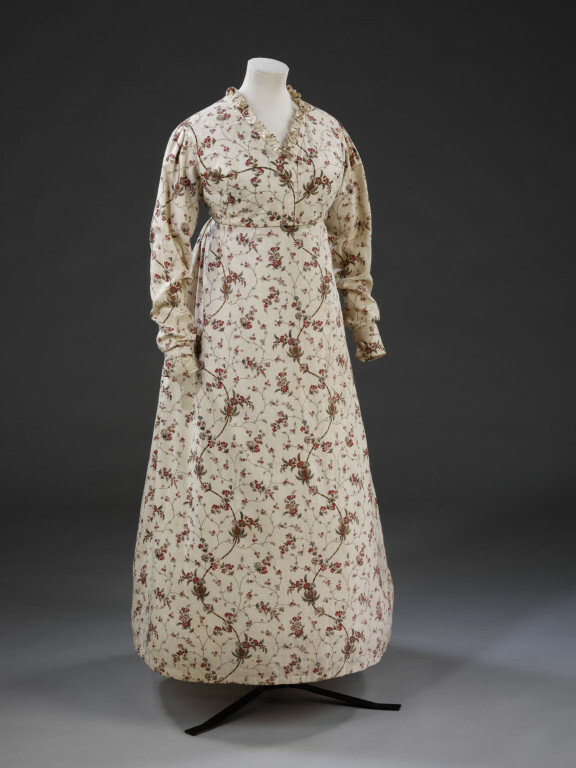 The pattern of floral trails seen on the printed fabric of this gown exhibits a blend of influences from Indian-painted and printed textiles, and woven silks, a style which remained popular until the end of the 18th century. 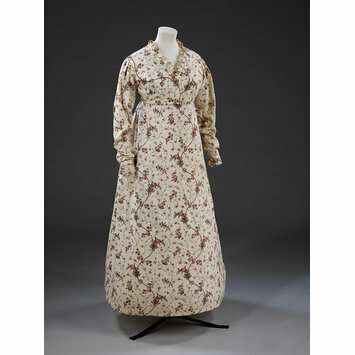 The sleeves of this gown are closed with a narrow band of fabric, which fastens with a hook and eye. Day dress of printed cotton. The dress is styled with a high-waisted , fitted bodice, which fastens centrally. The neck, which is trimmed with a 1" frill of matching material, is rounded a the back and V-shaped at the front. The bodice is lined with white cotton which extends 1/3 of the way down the full length tapered sleeves. A trimming decorations is attached to the wrist of the right sleeve (made from the same material and lined with white cotton), which fastens with a metal hook and eye at the hip. The skirt has an 'apron' style front with fastening tapes attached to either side, in addition to this there are vertical pocket slits situated at either side of the skirt measuring 11". The front and rear sides of the skirt are constructed from one width of fabric – 39.5" wide. The waistline at the back of the skirt is gathered a the centre and is constructed from two pieces of material measuring 46" wide. The cotton has blue threads in the selvedges denoting English origin, and is block printed in a polychrome palette with pencilled blue on a white ground. The design consists of an all-over pattern of delicate floral trails of carnations, pinks an other stylised flowers interspersed by vertical arborescent meanders bearing exotic fruits and stylised flowers. The pattern repeat measures 10.5" by 10".